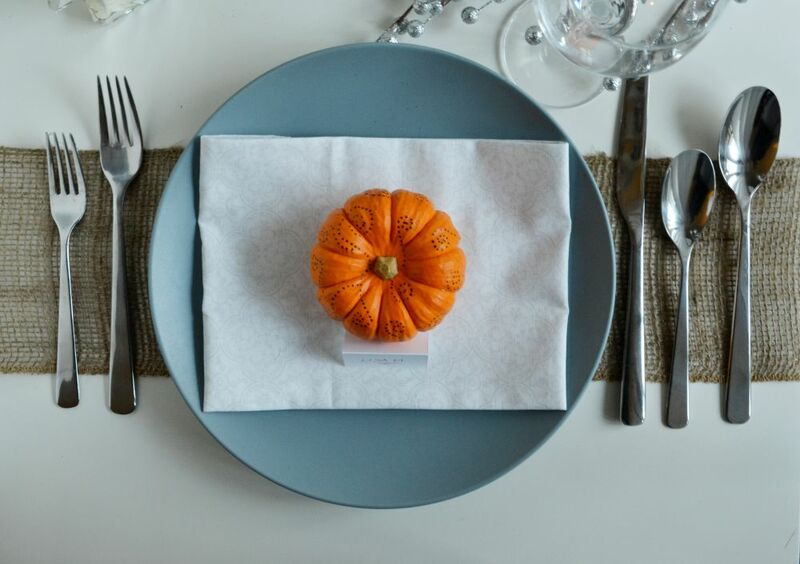 The holidays are about to arrive and if you find yourself looking for a last minute place setting idea, don’t worry, you can easily decorate a few mini pumpkins to use on your holiday table. 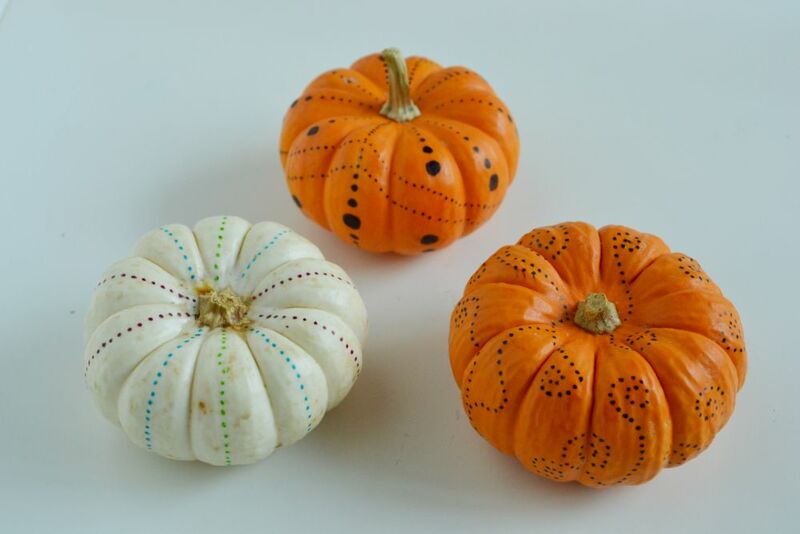 Pumpkins are all the rage for Fall decorating, but be sure to pick up a few smaller pumpkins that can be used in multiple different ways to decorate your home. Here’s a quick idea that your kids can even do to help you set up your table for a holiday party. 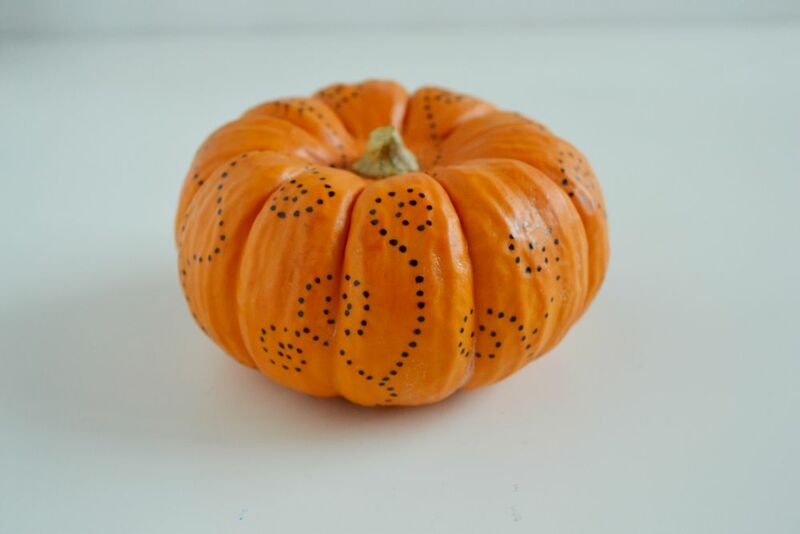 The sky is the limit here when it comes to adding a bit of fun to your pumpkins. I created dot patterns around the pumpkin in swirls for one, down the sides for another, and did a little bit of a freeform style for another. The fun part about this is to create whatever comes to mind. I typically prefer the dotted pattern so it doesn’t compete with any other décor that’s on the table. Determine your marker color choices by the color scheme of your overall décor. Sharpie markers come in all different colors, with different tips to give you the thickness you want. 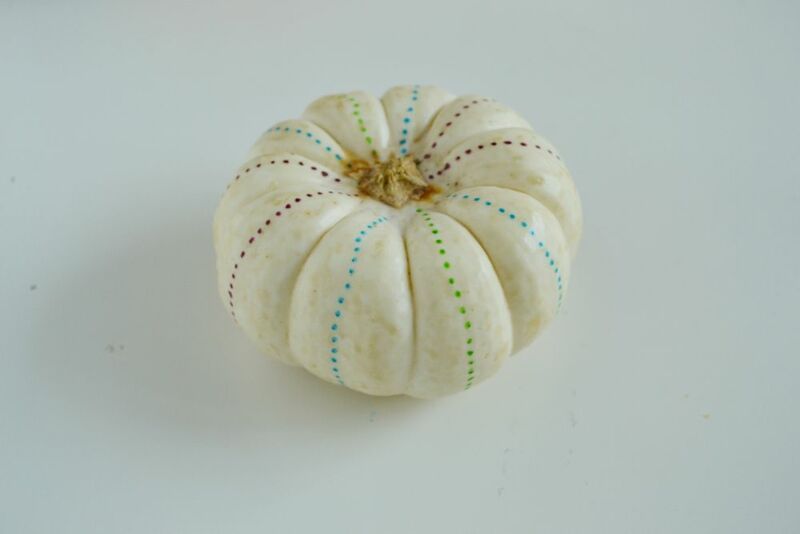 I found that it’s best to use a thin tip marker so it doesn’t bleed all over the pumpkin. Kids can be very creative with this craft, adding glitter or paint, to make it personal to them. 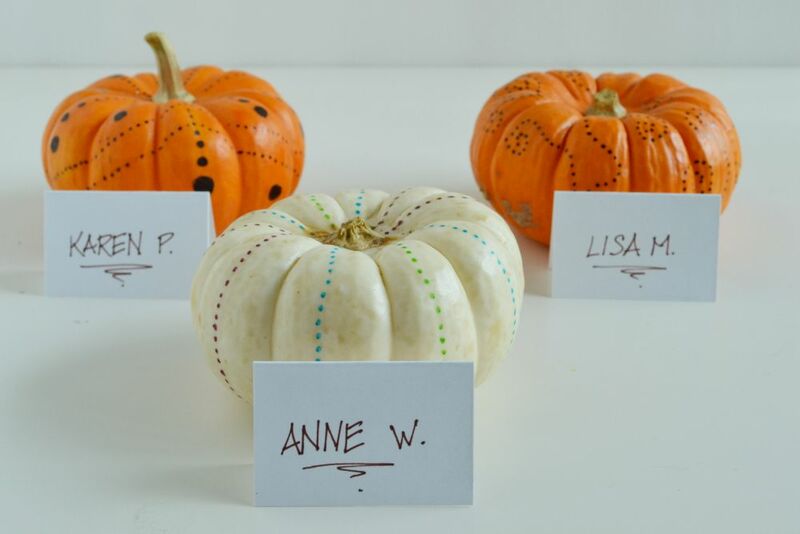 Add a simple place card in front of the finished pumpkin to complete the setting. 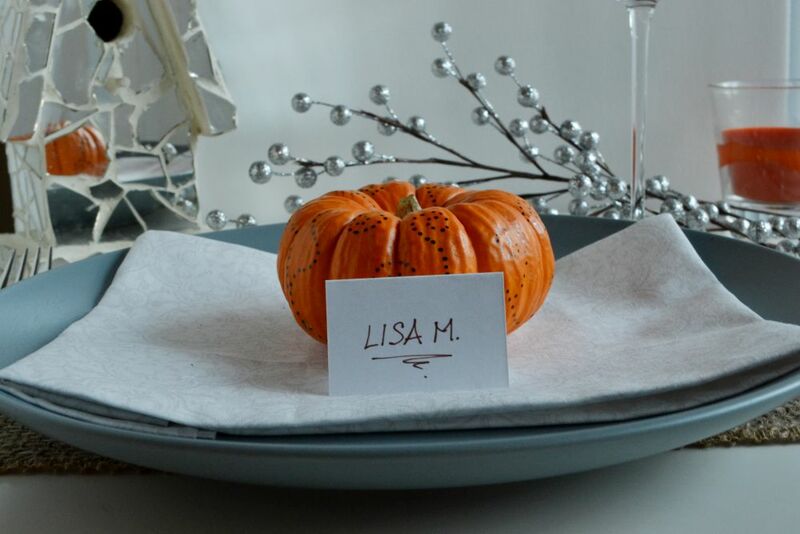 You can create place cards yourself, or buy a small pack from your local craft store. Add your guests’ names to complete the look. This modern table setting incorporates ribbon burlap, purchased from my local craft store, contemporary silverware, from Fab.com, blue plates, from IKEA, and fabric napkins. This is another easy craft that you can do while watching TV, or with a group of girlfriends in preparation for Thanksgiving. To me, the simplest, most affordable crafts are the best!